Groom and perfect unruly brows with the PUPA Eyebrow Design Set. Custom tailored to suit individual shades, the comprehensive eyebrow tool kit contains everything you need to pluck, preen and shape for gorgeously defined arches – all conveniently housed in a mirrored compact for on-the-move applications. The mini tweezers allow you to remove excess hair for the ideal starting point, while the subtly pigmented setting wax locks stray hairs into place without feeling sticky. Fortified with spherical polymers, the coloured compact powder offers a silky-soft texture and buildable coverage, working to fill in sparse gaps and add enhanced structure, with the double tipped applicator featuring a comb and angled brush for flawless looking results. Remove excess hair with tweezers. Draw the desired brow arch by applying the pigmented wax with the angled brush. Use the angled brush again to colour and fill in brows with the powder: use the flat side of brush for a thick line and the angled tip for a thin one. 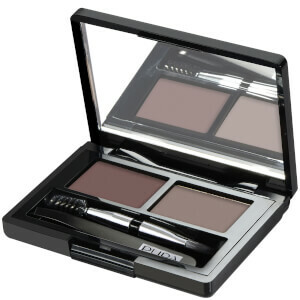 And last, use the comb to blend the powder and shape brows.